Even with the best quality tiles and workmanship, your tiling job could end up substandard if your grout isn’t up to scratch. Tilers Trade Centre on the Sunshine Coast can help you out with a range of grouts for commercial and domestic use that are tough, easy to work with, come in a huge choice of colours, have good colour consistency, will clean to their original colour and are virtually maintenance free. 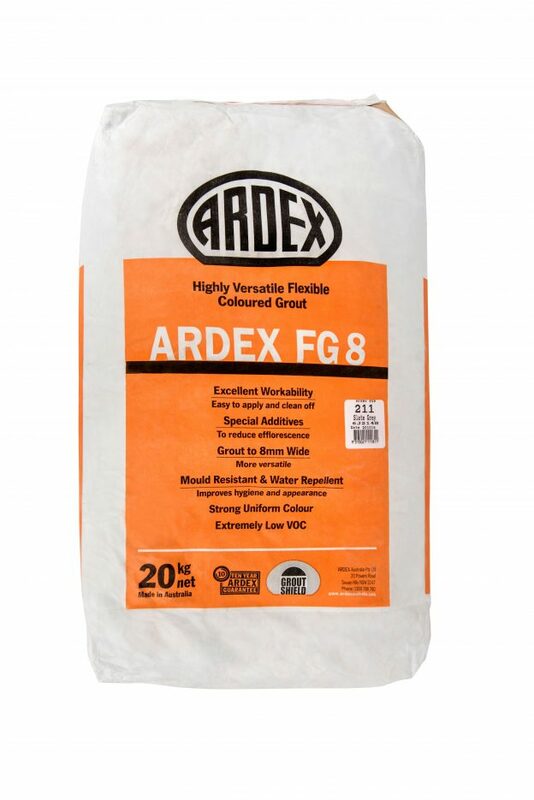 ARDEX FS-DD is a non-sanded cement-based, wall and floor grouting compound which is specially designed to be water and dirt resistant making it ideal for wet areas such as showers. ARDEX FS-DD is easy to apply and fast drying, with final cleaning able to be completed 24 hours after initial wash off with no residue left on the tile surface. The hardened grout is exceptionally easy to keep clean and will maintain its appearance as no water and dirt residue can seep into the grout joints. It is further protected from mould growth due to the addition of ARDEX Grout Shield which combats fungal and algal growth. ARDEX FS-DD is suitable for use internally or externally and is especially suited to surfaces prone to scratching such as porcelain. 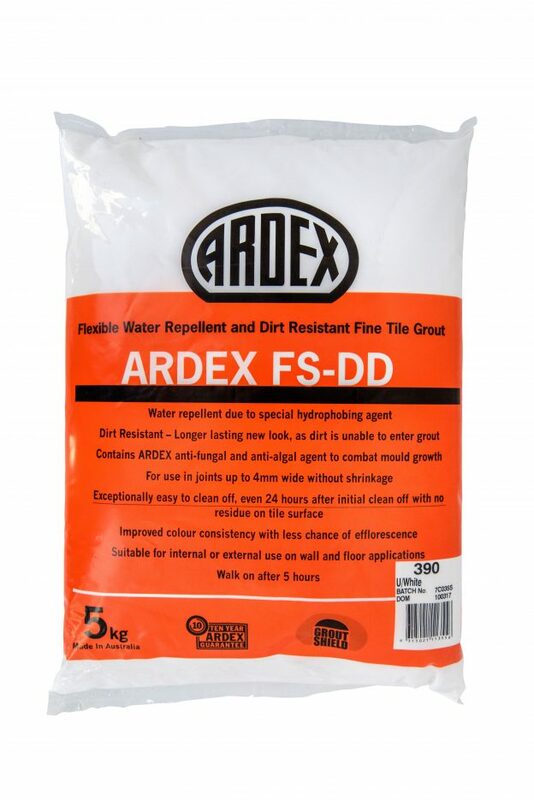 ARDEX FS-DD can also be used on timber floors and in swimming pools with the addition of ARDEX Grout Booster. It is available in a range of colours and can be used for both commercial and domestic applications. Excellent workability – easy to apply and clean off Strong uniform colour – reduces efflorescence Smooth finish, flush joints – reduces trapped dirt Polymer fortified – reduces likelihood of cracking Mould resistant & water repellent – improves hygiene and appearance Grout to 8mm wide – more versatile – Extremely low VOC – meets Green Building Council of Australia Green Star IEQ-13 requirements – Available in a wide range of colours. ARDEX EG15 is a high performance epoxy grout designed for situations that require strict standards of hygiene, high chemical and physical resistance. 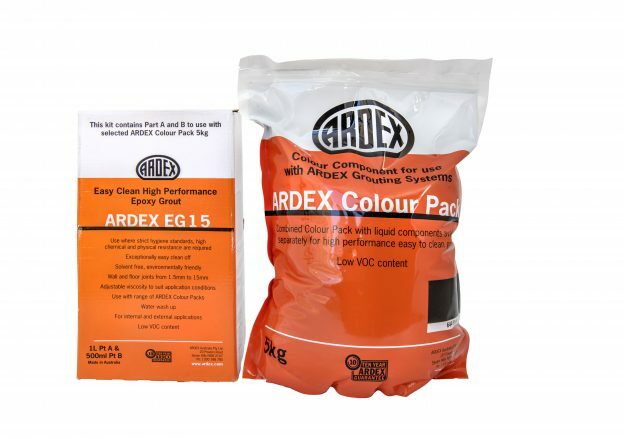 ARDEX EG15 is exceptionally easy to clean up during application. It can be used in joints up to 15mm wide on walls and floors. ARDEX EG 15 is a 100% epoxy grout system.